My favorite time of the week — the weekend! 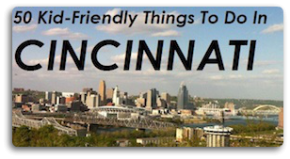 Once again it’s time to head out and enjoy all that greater Cincinnati has to offer when it comes to family friendly events and activities. Here’s are our picks weekend fun. You’ll notice there is a lot going on Saturday, it’s going to be hard to decide what to do. As always, if you know of something going on that you think other readers would like to know about, please leave a comment with the details. The more fun options, the better! Fall fun continues with lots of on-going activities taking place this weekend! Be sure to check out our post, Fall Events and Activities for Cincinnati Families, for a list of places hosting activities like hayrides, pumpkin picking, petting zoos and more! 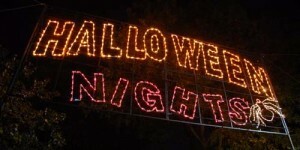 Halloween Nights at Parky’s Farm – Parky’s offers a fun, non-scary, Halloween event that includes a display of thousands of lights and lots of kid friendly Halloween activities. The fun runs October 7-30 and hours are Thursday – Sunday, 6pm – 10pm. Cost is $6 per person, under 2 admitted free. Totter’s Otterville hosts it’s first of two Fall Festival events Saturday from 11am-4pm. Fun includes train rides, a pumpkin patch and even pumpkin painting. Kids will have the chance to Tye-dye t-shirts, roast marshmallows and participate in fun festival games. Cost to attend is $12.95 per child with advanced ticket purchase or $14.95 at the door. Yearly pass members get in for $7.00 per child in advance, $9.00 at the door. Stop by McGlasson’s Farm in Northern Kentucky (off Route 8) Saturday for live music with bands like Jake Speed & the Freddies and River Cats. Have fun picking pumpkins, drinking cider and more. Music starts around 1pm and lasts throughout the day. Free to attend. The 3rd Annual Northern Kentucky Walk to Remember is Saturday at the Boone County Arboretum at Central Park in Union, KY. Registration starts at Noon. The event includes a 1.3 mile memorial walk designed to honor and remember those babies taken from their families far too soon. The Walk is free but donations are welcome and encouraged to St. Elizabeth Hospital, and earmarked for the Neonatal Intensive Care Unit initiative. More information can be found at www.missingalexis.org/walktoremember. It’s time for West Chester Parks & Recereation’s Great Pumpkin Fest! This Saturday head out to Keehner Park for fun that includes a not-so-scary haunted trail, pumpkin patch, petting zoo, inflatable rides and more. The event is free to attend and runs from 2-6pm. For more information call (513) 759-7304 or go online to http://www.westchesteroh.org. What could be scarier than the thought of a ghost in a museum? How about ghosts in two museums??? This weekend head to Lebanon for Ghosts in the Museums Tours. Check out haunted Harmon Hall at 7pm Saturday and Ghoulish Glendower at 7pm on Friday. Attendees will participate in a paranormal investigation while the museum staff provides history and insight into past haunted experiences. The investigation/tour is limited to 12 guests. Locations: Harmon Hall at the Warren County History Center, 105 S. Broadway, Lebanon. Glendower Mansion, 105 Cincinnati Avenue, Lebanon. Tickets are $45 per person and participants must be 12 or older. Reservations: 513-932-1817 or www.wchsmuseum.org. Get ready to break out the princess attire! 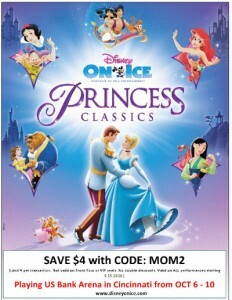 Disney on Ice, Princess Classics takes over US Bank Arena this weekend. Show times are Friday – 7:30pm; Saturday – 11:30am, 3:30pm, 7:30pm; Sunday – 1pm, 5pm. Tickets range in price from $14 – $56. For more information or to purchase tickets call 1 (800) 745-3000. Use the codeword MOM at TicketMaster to get $4 off each ticket! Who doesn’t love and arts & music festival? Saturday head to the Kennedy Heights Arts Center for the 3rd Annual District A Arts & Music Festival from 10am – 2pm. In addition to being able to shop for affordable art from local artists (items include jewelry, pottery, photography, small paintings, glass, and fiber works) attendees will find a range of free arts activities for all ages. For the younger crowd, Blue Manatee Children’s Bookstore hosts, ManaTots – stories and songs for children up to age 4. Event runs from 9:30 – 10am Saturday and is free to attend. For more information call (513) 731-2665. Grab your spurs and cowboy hat, it’s the LAST WEEKEND for the Old West Festival! Held annually on weekends through October 10, Old West Festival is located just off State Route 32, between Mt. Orab and Williamsburg. The Festival is fun for all ages with music, food, crafts, entertainment and a whole lot more. 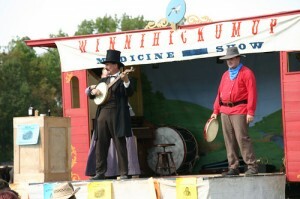 The Old West Festival runs 10 a.m. until 6:00 p.m. all weekend long. Admission is $10; Children 6-12: $6; Children Under 5 are free. You can learn more about the Old West Festival by reading Amy’s post, Whatever you do…don’t squat with your spurs on! Does your child like to work with their hands? Head to Baker Hunt Art and Cultural Center in Covington Saturday for a Birdhouse/Fairyhouse Workshop! Cost to participate is $20; workshop runs from 1-3pm. Call (859) 431-0020 to register (required). Does your teen know how to care for their car? Consider heading to Bob Sumerel Tire & Service (Maineville location) Saturday at 12pm for a Teen Car Care Clinic. Teens and parents are invited to attend this hands-on clinic that will include basic tips on preventative maintenance like checking fluid levels, important safety items to keep your car and more. Clinic is free to attend. Call (513) 583-9222 or visit www.aaa.com/carservice for more information. For your budding artist, check out Family ARTventures at the Cincinnati Art Museum. The free program helps children learn more about artists and art through hands on tours that include touchable objects and art stops. Tour kicks off in the front lobby at 1pm on Saturday and 3pm on Sunday. Parking just $4 (free parking for members).Visit http://www.cincinnatiartmuseum.org or call (513) 721-2787 for complete details. Itching for a road trip? Head to Bob Evans Farm Festival in Rio Grande. Fun happens all weekend long (Friday thru Sunday 9am to 5pm). Read more on the happenings in Amy’s post from earlier this week. Please note: You should always check event websites prior to visiting to confirm that details have not changed since this post was compiled. I think the Parkys Farm Halloween tickets must be purchased in advanced but am not positive. You can check the Hamilton County Parks website to make sure.